During the first three decades of the 20th century the Rio Grande Valley was promoted as a magical place where crops could be grown all year long. 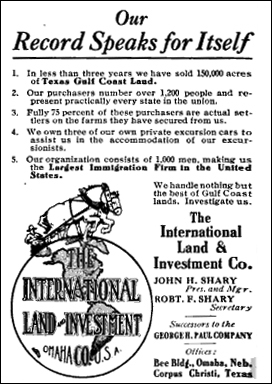 Valley based land development companies placed advertisements in major newspapers in the Midwest and arranged train transportation for prospective land buyers from cities such as Chicago, Kansas City, St. Louis and Des Moines. It was on one of these excursion trains that Bess Glick arrived in the Rio Grande Valley in 1926. Bess liked what she saw in the Valley and was especially fond of the mild winter climate. Upon returning to her home in Paris, Illinois, the recently divorced Bess loaded her children and a few of their belongings into her Model T and made the first of many trips to the Valley. Included in this group of travelers were Bess' twelve year old twin sons, Kenith and Kemper. Kenith's son Bob recalls how his father spoke of the arduous 1300 plus mile journey traveling roads which were little more than wagon trails. They would have to begin the trip with at least ten spare tires on hand. Truly one of the earliest Winter Texans, Bess never spent a summer in the Valley. She and her children would return every fall, first in her Model T and later in a Model A Ford. Kenith Glick attended and graduated from Edinburg College which is now UTRGV. After graduating he moved to Chicago where he worked for General Motors during the World's Fair of 1933. He soon moved back to Pharr, Texas where he and his twin brother Kemper began an orchard care business with the encouragement of the Bentsen family. When the United States entered World War II, Kenith and Kemper enlisted in the Army Air Corps. At the wars end, in 1945, the twins came home to the Valley and opened Glick Brothers Army Surplus Store at Three Mile Line Rd. and Conway in Mission, TX. In 1950 Kenith and Kemper moved the business location to the 400 block of West Business Highway 83 in Pharr, TX and changed the name to Glick Twins. By the end of 1963 they had expanded the store to encompass the area it occupies today. Kenith and Kemper Glick had a keen interest in hunting and were savvy businessmen when it came to providing the necessary supplies to hunters in the Valley. During the late 1970s Glick Twins transitioned from being an army surplus store into a full service outdoor sports store including camping, hunting and fishing supplies. It was in the late 1960s that Kenith's son, Bob, began at the age of seven to help out around the store by sweeping up and doing various other chores. Bob paid attention to what was going on around him and developed a keen sense of business and a passion for hunting. During our interview, Bob recalled that in his teenage years he spent most of his extracurricular time honing his hunting skills. 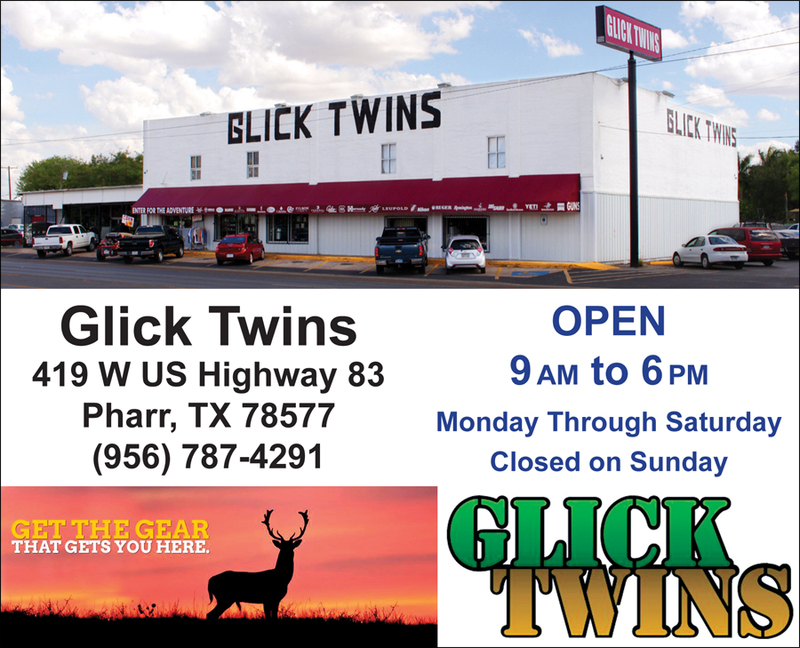 In 1990 Glick Twins phased out their line of camping and fishing supplies and focused in on becoming the premier shooting sports store in the Valley. Bob Glick took over operations of the store in 1987 and purchased the business in 1998. He has surrounded himself with a staff of employees who know the ins and outs of shooting sports. While the main focus of Glick Twins is shooting sports, Bob said that there has recently been a large volume of sales for defense. From their early beginnings in the 1930s, the Glick Twins, Kenith and Kemper, gathered a vast amount of knowledge and expertise which they developed into a time tested successful business. Now the torch has been passed to the next generation as Bob Glick continues in the tradition of providing excellent products and service to the residents of the Valley. 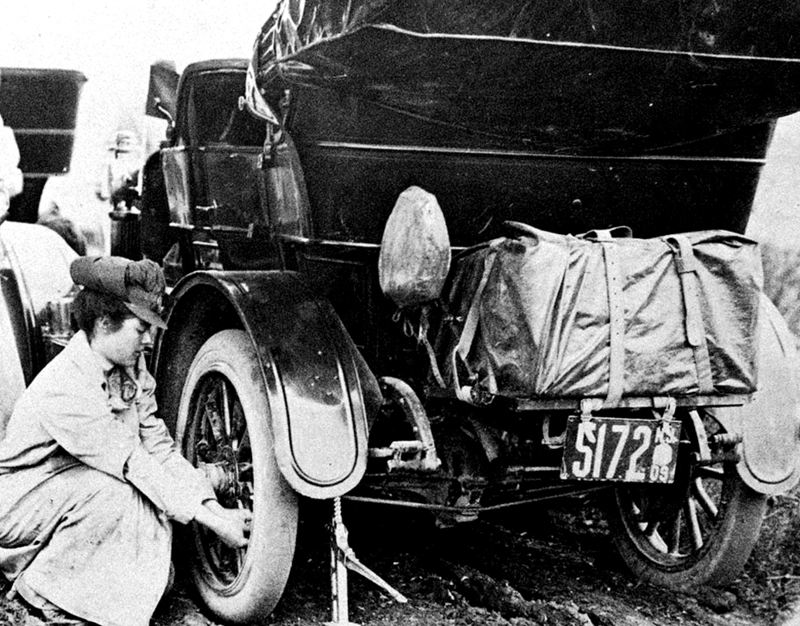 Unpaved, primitive roads in the 1920s and 30s made travel by automobile an arduous undertaking.